IT’S all change at The Woods End at Bramerton. This historic pub re-opened just over a week ago with a complete new look. In fact it’s now “Water’s Edge, Woods End” with new leaseholder Lee Webb determined to throw off a bad reputation – especially online. That’s the power of Tripadvisor: that’s the tyranny of Tripadvisor some would say. The master plan, says Lee, is to make the Water’s Edge a “destination restaurant” with the main market being the thousands of people down the road in Norwich. 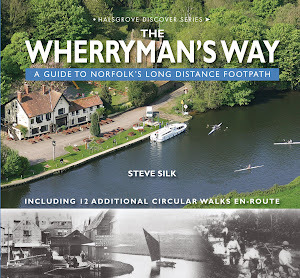 Wherryman’s Way walkers will rejoice that it’s to become an all-day venue too. He’s not there yet, but the plan is for an 8am start with breakfast, coffee and Danish pastries available for hungry ramblers. And while he’s a leaseholder, he stresses that he pays rent to a property management company rather than a pub chain. In other words he’s not tied, drinks-wise. Real ale fans are offered Greene King IPA, Old Speckled Hen and Woodforde’s Wherry. On the menu; starters of leek and potato soup, crispy pork belly, pan-seared queen scallops, salmon gravadlax and icelandic prawns; the mains are more crispy pork belly, crispy chilli beef, pan-seared sea bass and char-grilled sirloin steak. Starters are £5 or £6. Mains vary from £8.95 to £18.95. Above all, he stresses, he wants to be reliable. Always open, seven days a week, without the annoying hand-written “Due to Family Illness…” notes that have been known here in the past. There’s been no big launch yet. He’s been happy to let people find him so far. But 130 covers for Mothering Sunday wasn’t bad for Day Three. Good luck to you, Sir. * Read about the last new dawn at Woods End in 2010 and my bid for “Boots as well as boats” in 2009. We happened by chance to wander in to the "Waters Edge Woods End" on Easter Monday, my what a transformation, it is fantastic!, clean, stylish, full of atmosphere and my goodness we want to return to taste the food. I have eaten at new Water's Edge, food quality is variable & not an all day offering. Got charged silly money for diet coke, weirdly listed on bill as Pepsi? with " a dash of Coke". I am concerned it might not all have been sugar free (which is dangerous for diabetic customers). Both outdoors & in suffers from the delightful Eau de Norwich Sewerage works. Visited the Water's Edge this Monday. Nice looking Pub very friendly, welcoming staff. Excellent Belly Pork. A very pleasurable visit. Would recommend. great food, great atmosphere,beautiful location,would highly recommend! Tried the waters edge for the first time 6 Sept with a couple of friends we were shown to our table at 7.40 drinks order was taken, waited ages before they turned up, same with the starters when the mains finally turned up at 9.15pm I had the pork with mash which was stone cold I complained so they brought me another which was just warm then they realised they had forgotten the garnish so the waitress wandered from the kitchen through the pub with it in her hand (no glove) and plonked it on my warm pork, desert was ok but had a lot better, to finish the women had a cup of tea which when we received the bill was £2.75 a cup. good food, nice company and an old world canvas sewing workshop next door that sells gifts and duck food as well as making/repairing boat covers. I supported both businesses while I was there as the climate is tough enough for the small guys. Extremely overpriced food and drinks. Far too long to wait for average. A greasiness manageress and condescending owner / leaseholder. A place to be seen? The signature dish of a sliver of fatty pork belly on cold pickled veg and lumpy potato illustrates the pretentious nature of the place, cheap food tarted up. Even the loos had this from the word go with torn wallpaper glued over rather than being replaced. Unfavourable comments on trip advisor for example are attacked rather than addressed and every opportunity is taken to advertise future events,ask complaining clients to comeback with discounts or promises and other local places derided,0. STAND UP TO COMMENTS AND IMPROVE. Lee has worked very hard to improve this failing riverside pub and must be given credit. He welcomes land comers and boaters; his waterfront inprovements are excellent. The food is interesting and not expensive and his drinks range is wide. This is a demanding location and he has done well to get it going. Don't knock it, give it a go. David Freyja.